NIPPON SEISEN CO.,LTD. have developed palladium alloy roll-plated hydrogen separation membrane for high purity hydrogen gas production and purification. NIPPON SEISEN CO.,LTD. 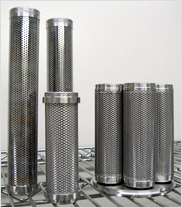 have combined our unique metal filter technology with the characteristics of palladium alloy which only allows hydrogen particle to go through the filter. We have wound 10 - 20 μm thick palladium alloy membrane on dia 34mm, 300mm length cylindrical body. Completely wiping out any possibility of hydrogen gas leakage through unique welding, this allowed us to produce ultra-high purity hydrogen. Our unique three layer structure which enhances sustainability and endurance have allowed us to withstand its long-term application on commercial basis. All parts of this module are made of metals. Using welding, this allows us to adapt to both small and large quantity order and even to massive plant application by alternating its parts combination. Main application for this hydrogen separation membrane module is PSA(Pressure Swing Adsorption) for hydrogen manufacturing machine at oil refinery, hydrogen manufacturing machine at hydrogen station that is drawing interest from the stand point of combustion-battery, fuel cell vehcle(FCV) development, hydrogen refinery process of house-hold combustion-battery, as well as ultra-high purity hydrogen gas refinery in semi-conductor industry. 1. Zero-defect thin palladium alloy winding cylindrical module adopting unique film welding technology. 2. Resolving past problems and achieving high reliability and longer tool life by adopting drastic three layer structure. 4. Smaller, lighter than current products. Lower unit price.